It stays close to its inspirations and risks growing repetitive, but Anodynes darkly surreal atmosphere is gripping. Anodyne is the stuff that dreams are made of. Its 16-bit-styled world is a tapestry of lightly strange, largely unexplained locations: you'll come across a forest, a mountain area, a swirling void populated by leggy sentient shrubs – you know the drill. As with a real dream, there's little rhyme or reason reason as to why it's assembled the way it is, why a talking rabbit tells you off for your sloppy brushwork or why dead-faced clones seem to gather in empty rooms, accompanied by the sound of chattering crowds. The game merely begins with your character, Young, jumping into this patchwork purgatory from a Dark Souls-style Nexus world, before a Sage – there's always a Sage – sets him off on his mysterious journey. "As with a dream, there's little reason as to why it's assembled the way it is"
Structurally, Sean Hogan and Jonathan Kittaka's game owes a considerable debt to the Game Boy classic The Legend of Zelda: Link's Awakening, which similarly took place within its hero's decidedly overactive subconscious. There are dungeons to clear, bosses to fight and puzzles to solve, as Young grows in both constitution and ability. While these elements compare favourably with any of the 2D Zeldas, the game's reliance on keys as the means of ordering progress can border on repetitive at times. 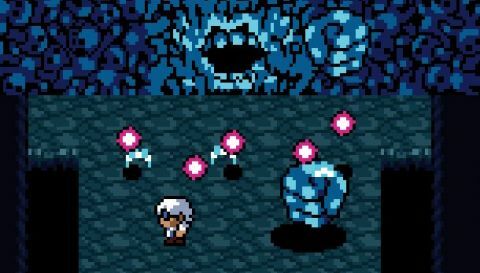 Anodyne can be as funny and charming as Link's Awakening on occasion, but the overall tone is one of unease, with a subtle malevolence – the 'something seems a bit off here' factor – reminiscent of the indie horror Lone Survivor. Meaning is elusive, but themes and motifs soon begin to take form, in a game that feels increasingly personal the more you burrow into it. The game is at its strongest when you're exploring the sizeable overworld, which like all the best Zelda-a-likes constantly expands and loops back on itself, as you revisit familiar areas to mine for secrets, or unlock the next chunk of dreamland. This is a game crammed with secrets, from odd encounters with equally odd characters to collectible cards that seem to serve no purpose. "The overall tone is one of unease, with a subtle malevolence." One moment in particular stuck with me. Partway through I was sucker-punched by, of all things, the context-sensitive action button, which suddenly performed one of its more violent functions at a totally unexpected moment. I could have walked off-screen, perhaps resetting the situation but, intrigued, I pressed the button a couple more times. I was rewarded with access to a hidden part of the world, and given new respect for a game that isn't afraid to play around with the fundamentals. In terms of length you'll get through Anodyne in a matter of hours, but it's unlikely you'll find everything on your first run through, and I doubt I'll ever get to the root of its narrative mysteries. It's this sort of inscrutability that incites debate and inspires fan theories, and I can't wait to see what others are going to make of it all.